The Circulatory System and What It Means To You! The HEART pushes the blood around the body. Blood Vessels: ARTERIES [one type of vessel] carry blood from the heart and VEINS [second type of vessel] carry blood back to the heart. CAPILLARIES work with both the arteries and veins, and are categorized as blood vessels as well. They distribute blood with oxygen to the tissues of the body and they collect blood without oxygen from the body and give it to the veins. Blood is the medium we require to fill us with oxygen, nutrients, vitamins and defense mechanisms to help fight off bacteria and disease. Red Blood Cells form in the bone marrow and they’re important for the protein that carries oxygen. Two major circulations split our circulatory system: the lungs and the body. Each need their own pumps. Here’s where the 2-for-1 deal comes in: the heart is split in two and divided by barriers. [To get technical on ya for a second, the barriers are called the INTERARTERIAL SEPTUM and INTERVENTRICULAR SEPTUM]. 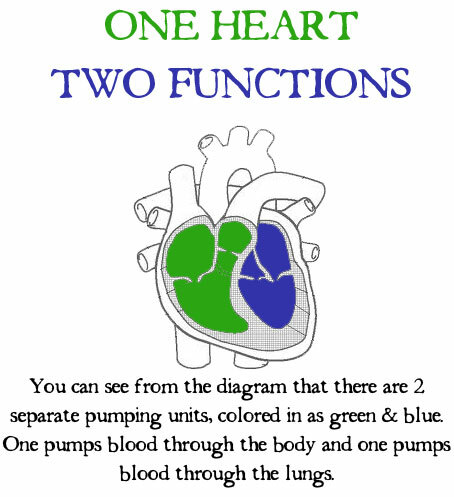 The left side of the heart is complete and the right side of the heart is complete so they each function as SEPARATE PUMPING UNITS. The right side of the heart pumps blood through the lungs [PULMONARY CIRCULATION]. The left side of the heart pumps blood through the body [SYSTEMIC CIRCULATION]. Okay, so blood that’s been all hopped up with oxygen leaves the left side of the heart and goes into the biggest artery [called the AORTA]. That big ol’ artery branches into smaller arteries and then into even smaller arteries and into even tinier arteries than that, all over the body. Blood enters in the smallest arteries of all, the capillaries, and this is where the exchange happens: the good for the bad, so to speak. The good, rich oxygenated blood full of nutrients goes to the cells while carbon dioxide, water, waste and blood without any more oxygen, all gets taken out of the cells. Once all of that waste and the deoxygenated blood gets taken out, the capillaries give it all to the veins. The veins carry the carbon dioxide and waste away from the cells while sending the blood without any oxygen back to the heart. Once in the heart, that oxygen-less blood gets sent to the lungs to pump itself up with oxygen and the whole process starts over again. This is a very basic overview of how the circulatory system works. I think what floored me the most was the fact that soooo much happens automatically, and most of us aren’t even aware of it. This process never stops until the day we die. No parties. No evenings out. No cigarette breaks. SO DOESN’T IT MAKE SENSE TO GIVE OUR BODIES THE NUTRIENTS AND RESOURCES IT NEEDS TO PERFORM THESE FUNCTIONS THE BEST THAT IT CAN? Yes, it absolutely makes sense.